Movie tie-ins are usually games you want to stay away from. That is of course, in the rare case where the game is actually an extension of the original story. Ghostbusters is the latter, and definitely not one you want to brush off without a second thought. But at the same time, it’s no Escape From Butcher Bay. The action – the act of actually wearing down ghosts and trapping them is fantastic, and it looks stellar! It’s quite challenging at times, too. I figured trapping ghosts would be as simple as directing them toward the trap, but often times they’ll put up quite a fight and you might find yourself chasing after them having escaped your capture beam. Combat can be a bit frustrating at times, as your character isn’t overly maneuverable since he’s sporting a 100 pound proton pack. You can however, take a leap forward and back, and sidestep. Doing so in a combat situation is easier said than done, though. I found the difficulty to be up there, on the normal setting. Not that it was overly hard, but the fact that you can’t quickly get out of the way of incoming projectiles and spend more time reviving falling team mates, which inevitably puts you in a vulnerable position, tips the scale a bit against the player. Surprisingly, there are many weapons at your disposal, aside from the standard issue proton beam, which are unlocked over the course of the campaign. Some more fun to use than others, but I found myself using them all from time-to-time. Knowing which weapon is most effective against a given enemy is key to taking them down as quickly as possible. And you can acquire this knowledge by getting a complete EKG scan. I found myself with the EKG scanner equipped almost always, when not in a conflict situation anyway. Aside from finding and learning about ghosts, the EKG scanner can provide objective tips and help you locate “cursed artifacts” – collectibles which unlock achievements/trophies. The single player campaign takes you through many diverse locations, and the missions themselves are quite lengthy. But overall, it’s a pretty short game. I wrapped up my first play through in just under 7 hours, and I definitely wasn’t rushing. There are a few good reasons to replay the campaign, though. Aside from achievements/trophies for collecting items and scanning ghosts, there are some awarded in certain scenarios which might have been missed. Last night I spent about half an hour playing some of the online modes with a friend. I was actually just starting to enjoy myself when we decided to call it quits. I’m not sure what I was expecting, but the fun factor wasn’t exactly peeking from the get-go, which was a bit of a drag. The game modes were all pretty standard – co-op deathmatch, survival, capture points, defend, etc. Achievements/trophies are only awards during ranked matches, which you can’t play with friends. Kind of silly, considering all of the online modes are co-op. 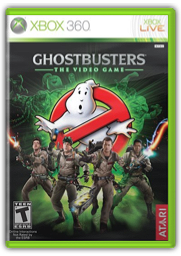 Ghostbusters: The Video Game is one that fans of the movies will love, without a doubt. It’s very true to the source material and a lot of fun, especially early on. But with its short campaign and questionable online play, it’s hard to give it a solid “go out and buy this now!” recommendation. I bought it, since my wife was crazy excited to get her hands on it as well, and my eldest daughter is now playing it too. So definitely money well spent in my household.